A compute cloud is a pooled set of virtualized compute and storage resources allocated on demand across many applications. The Cloud Computing market is growing quickly, projected by IDC to become a $42B market in 2012, driven by simple economics of scale: it is cheaper to operate large-scale cloud computing infrastructure accessed across many applications than building traditional silo enterprise datacenters. A core component of cloud computing is a highly scalable, cost-effective, high performance, highly reliable and intelligent networking. In this talk, we review the benefits of cloud computing and describe the requirements of the underlying networking platform that enable these benefits. 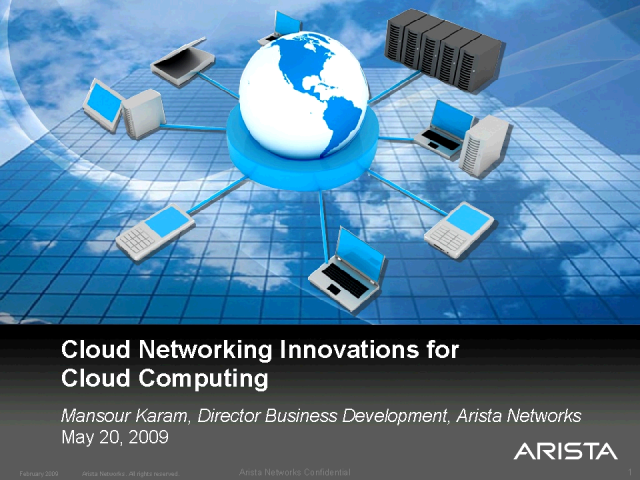 Mansour Karam; Director of Business Development at Arista Networks, Inc. Presented by: Mansour Karam; Director of Business Development at Arista Networks, Inc.